Which ones are the jellyfish eyes? A movie with a Japanese monster. A roving picnic by the river. You probably know the deceptively sunny paintings, the anime-esque sculptures, the must-have merch. You definitely recognize Mr. DOB. But unless you’ve been city-hopping due east and north, you haven’t seen iconic artist Takashi Murakami‘s debut film Jellyfish Eyes. It’s a tale of “poignant memories and wondrous dreams”. Which you probably guessed from the title. 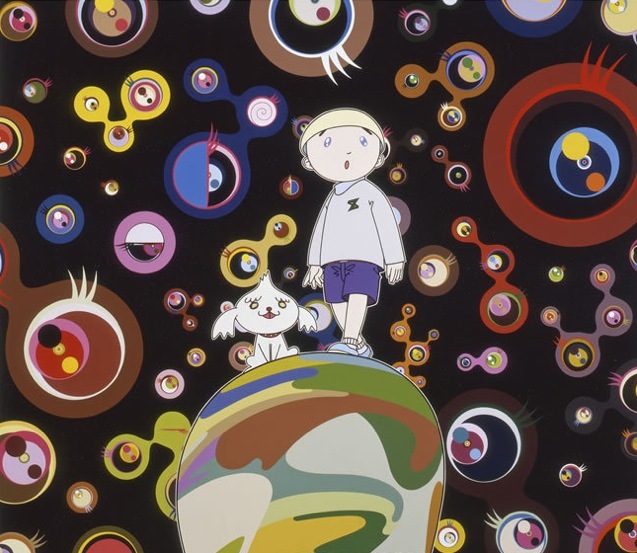 And your only chance to see Mr. Murakami introduce his feature-length, live action + animation movie in the foreseeable future is Friday’s one-night-only screening at the gorgeous United Artist theatre at the Ace Hotel: Downtown L.A.’s maverick new kid on the block. Yes, Jellyfish Eyes features a natural disaster in Japan. Yes, there are monsters. Yes, appearances can be deceiving. Otherwise, Ms. Go Go’s lips are sealed. JELLYFISH EYES — Fri, May 30. Doors @ 7pm. $20 GA; $300 premium pkg. — Theatre at Ace Hotel, 929 Broadway, DTLA 90015. More info & tix HERE. Can you do it? Yes, you can. The most famous (infamous?) 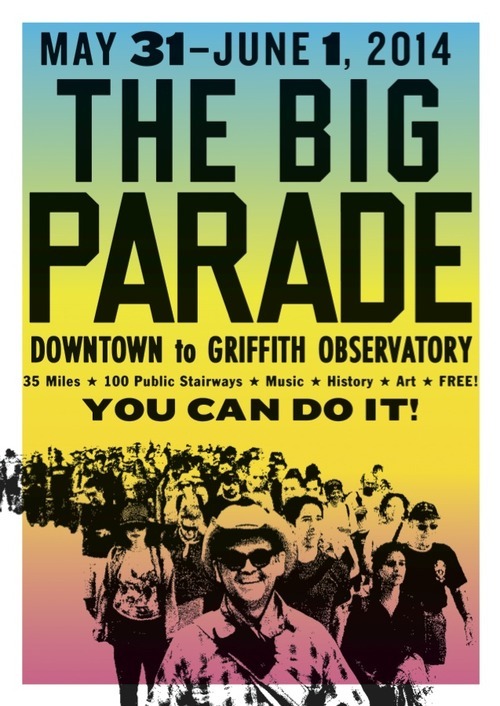 details of the epic urban hike known The Big Parade are its 35 mile Downtown-to-Griffith Park itinerary, its 100 public staircases, and its two-day schedule. Easy to see why those details might stick out. Lesser known details about the hikes are the exclusive parties, the chance to spy secret parts of Los Angeles, and bragging rights about being an Angeleno who actually walks in L.A..
Perhaps the most important detail? You don’t have to do the whole thing! Although many, many people do the whole hike, Big Parade founder Dan Koeppel has created detailed timetables to facilitate your ability to ease in and out of the parade at will, with or without kids. Sunscreen and water a must. Clowns and baton twirling optional. THE BIG PARADE — Sat, May 31 8:30am – 7:30pm; “walkers-only” party 7:30-9:30pm & Sun, June 1, 8:30m – 7pm. All ages/FREE. More info HERE. Take me to the river…. Like a Picnic. But Standing. Go Go’ers, it’s nice when good things get better. 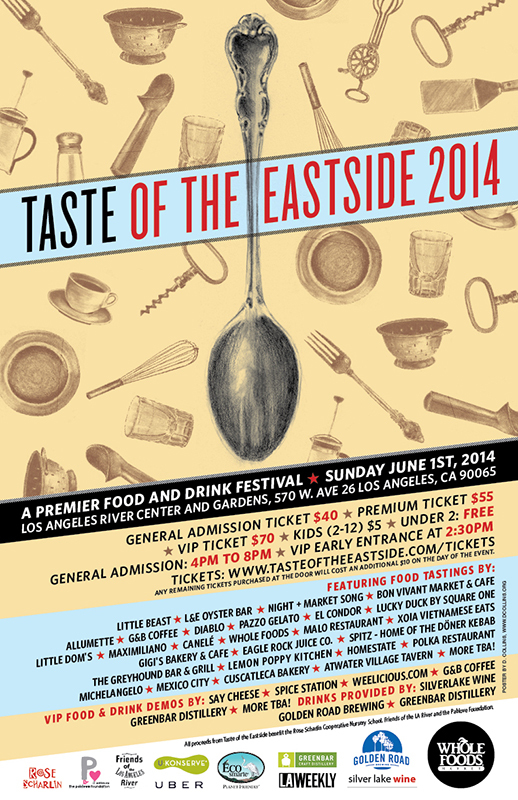 The 4th Annual Taste of the Eastside, which features two dozen restos headquartered in Silverlake, Echo Park, Los Feliz, Highland Park, Atwater Village, Eagle Rock and environs, has moved from the lovely Barnsdall Park to the even more gorgeous Los Angeles River Center and Gardens. So expect a feast for your peepers as well as your mouth. In addition to tastes from Little Beast, L & E Oyster Bar, Little Dom’s and Maximiliano, there will be demos featuring cookbook author and caterer Jenny Cooks, Say Cheese owner Glenn Harrell, spirit tastings from Greenbar Distillery and more with additional options offered as part of the VIP ticket package. And in addition to eating well, you’ll be doing good: proceeds benefit Rose Scharlin Nursery School, Friends of the Los Angeles River, and the Pablove Foundation. Go Goer’s, this is what they call a nom no-brainer. TALES OF THE EASTSIDE — Sun, June 1, 4-8pm. $40 – $70; kids $5 — Los Angeles River Center and Gardens, 570 W Ave 26, 90065 More info & tix HERE. Check out The Go Go on EAT: Los Angeles, LA.’s best online source for curated food news and reviews! Previous Post The Weekend Go Go: Kings of Cult, Myth Masquerade, Gratis Salsa Concert + perks for military!